GT3582R-HTA with TiAL turbine housing. 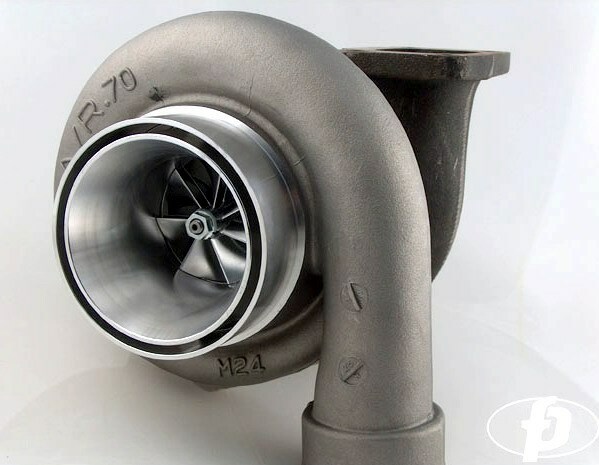 Our FP GT3582HTA turbocharger is very similar the to the standard GT3582R Garrett turbocharger in overall size and footprint, but that is where the similarities end and your new found power begins. It comes with a 4.0 inlet and 2.5 outlet anti-surge ported compressor housing. This new and improved style of anti-surge port provides a longer and more gentle bell mouth guide for the air all the way down to the inducer tips. The standard turbine housing is the T31 housing in 2.5 outlet for compact installation applications such as 4G63. Other turbine housings styles are available. Repeated dyno testing and thousands of miles of street punishment have shown how much faster spooling the HTA is compared to the normal 35R. Midrange and bottom end torque which are usually dismal in regular .82 A/R GT35r kit cars are DRAMATICALLY improved with HTA compressor technology!